London: Michael Joseph Ltd, 1989. 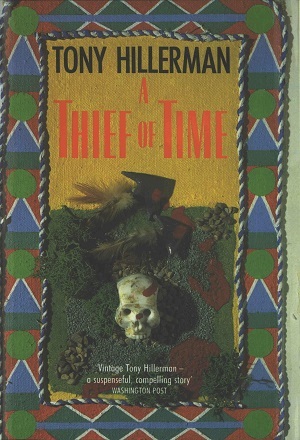 This is the first United Kingdom edition of A Thief of Time, published in 1989 by Michael Joseph Ltd., in London, England. Michael Joseph Ltd. is an imprint of PenguinGroupUK that publishes highly commercial popular fiction and non-fiction and Top Ten Bestsellers. The cover is very similar to covers printed by Sphere Books Ltd. which is an imprint of the Little Brown Publishing company. The cover illustration is by Neil Breedon. Format: Hardback, 22.2 x 14 cm. Binding: Strong red covers with the author, title, and publisher's logo printed in gold vertically on the spine.